on the weekend I was playing with some shipping tags and thought I would share with you what I made. 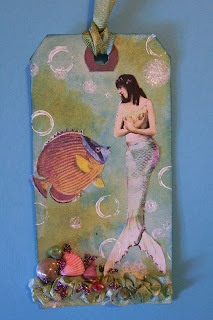 I used Distress inks for the background, white acrylic paint, Stickles, dripped and dabbled Ditto Shimmer sprays (they have a nice shimmer to them), added some glossy accents, dyed some seam binding and gathered it on the mermaid tag.Sea shells, and micro beads were also added. I miss doing tags and ATC's so when I do them, I really go for it and enjoy it quite a bit. I think because they are smaller canvases and they don't take days to do, although some ATC's I really think about them for a while to conjure up an idea. This tag is for the Yahoo group Gecko Gals Paper crafting Group, Bathing beauty challenge. I just snuck her in on the deadline. I used a bit of sandpaper at the base to give some texture and interest. And a real mini sea shell on her head. I also coloured her bathing suit with pencil crayons and gave her some rosie cheekers. I still need to think of something witty for this one. I am thinking something about turning into a prince if you kiss me.....I know weird sense of humor. I am in a tag swap over at Tee's The Altered Paper later in the month which prompted both these tags so this one is probably going to my swap partner, not sure who that is yet but it will be fun to send. I am also working on a mini hutch my hubs was able to bring home free from work. It is old and has been around the block but he salvaged it for me and thought I could put my piles of craft supplies in it. I think he was hinting to put it away. Being in a small house, space can be limited but I need to keep it all together and more organized, so, I am all finished base coating it so just thinking what to put on it for design. I need to finish it up soon. I have to start painting for my shows and need to start a little earlier this year. Thanks so much for sending me those images, I love them! 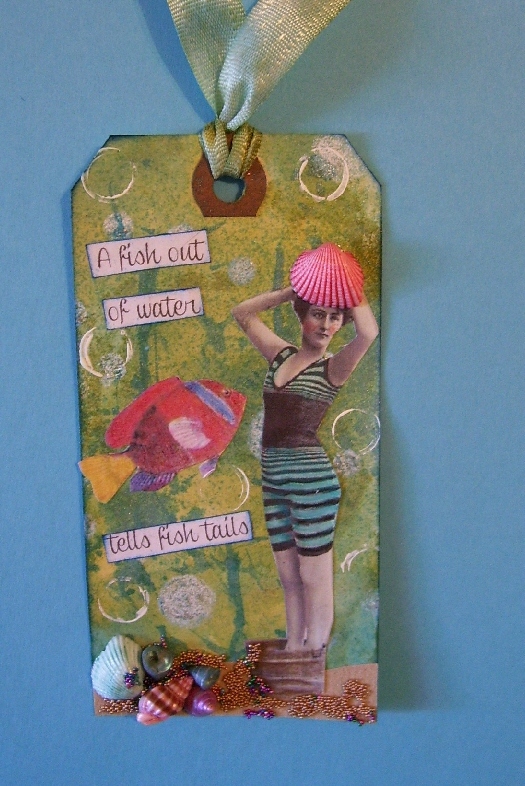 Such FUN summer tags! Adore the pink seashell.